LAFAYETTE — Registration for the fifth annual Subaru Color 5K is now open at www.subarucolor5k.itsyourrace.com. The run/walk fundraiser will be on Saturday, June 15 and the goal is to raise $50,000 for Special Olympics Indiana, which is celebrating its 50th anniversary in 2019. Organized and hosted by Subaru of Indiana Automotive (SIA), participants are showered with colored powder, made of food-grade corn starch, at stations along two available routes. The event offers the choice between a 5K trail course and a one-mile asphalt course. For competitive 5K runners, awards will be presented to the top overall male and female finisher, as well as the top male and female finisher in seven different age categories. Those who register by the online deadline of June 12, the cost is $35 for adults and $30 for children 10 and younger. On race day, the cost is $40 for adults and $35 for children. In addition to registering, participants can use the website to recruit family and friends to join their team or make a contribution. Awards are given for the largest team and top individual fundraiser. Last year’s event attracted over 550 participants and raised over $45,000 for Special Olympics Indiana. 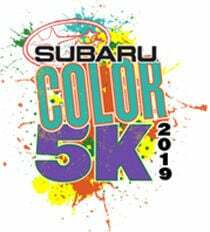 Since its inception, the Subaru Color 5K has enabled the SIA Foundation to provide Special Olympics Indiana with nearly $130,000 in support of the organization’s year-round training and competition in more than 20 sports for children and adults with intellectual disabilities.